> I don’t know how it happened, but somehow at the end of August all of the wedding stuff (well, the big stuff) just came together. It started with the ceremony location. I was wandering through Google searches for secular ceremony locations in Ottawa, wondering how we were going to fit 150 people anywhere pretty. 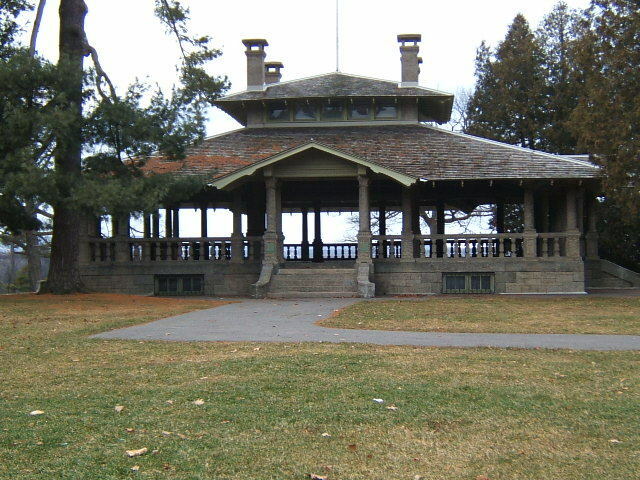 And I came across the gazebo in Rockcliffe Park (see above). Now this picture doesn’t do this location justice – generally the place is covered in flowers. It’s covered in case it rains (which it will because this is me). And it fits how many? 150 people. Ceremony location? Check. Then came The Dress. I’m not posting pictures of The Dress because it’s too beautiful to be photographed. Or I just want to leave some things a surprise. Or both. Anyway, I found The Dress on PreOwnedWeddingDresses.com, a wicked site filled with designer gowns being sold for 1/4-1/2 of their original price because they’ve only been worn once. The Dress is, well, fantastic. Teensy bit traditional but not so much that I can’t jazz it up with a gorgeous piece of ridiculous jewelry (I’m thinking big chunky amber necklace…). I love it. As does A. (that’s right, he’s seen it and no, I don’t think our marriage is cursed now). Wedding dress? Check. And finally, the all important reception location. This was causing me some grief. 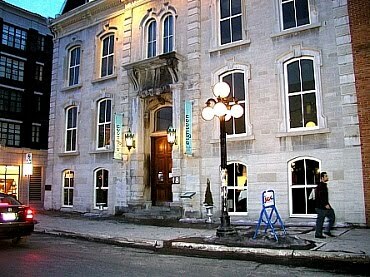 First, it had to be a place that fit 150 people which in and of itself was tougher than I thought it would be. And I didn’t really want to have the reception in a hotel…or a community center…or the Legion. Not that there is anything wrong with these places, but they just aren’t us. So already I was limited. But when I went searching I was faced with another problem: money. If we had the wedding in town, near our ceremony location and the hotels, we had our pick of hotels (meh) and museums or galleries (yaya! )…but we were looking at $150-$300/head. HAHAHAHAHA. Not happening. If we had the wedding outside of the city, we could pick from much cheaper and in many cases nicer character homes and golf courses (meh)…but we were looking at a pretty hefty commute of 45 minutes from the nearest hotel which doesn’t sound like a lot unless a) you have no car and b) you have no extra money lying around to help others with transportation. Which is important, I think, given that people drink at weddings. Asking guests to fork out whatever amount in cab fare didn’t seem right and we couldn’t really afford to rent shuttle buses (a friend of mine did this – a good idea, actually, but just a little too pricey for us). Plus I like the convenience of being close to the hotels and the ceremony location. What to do, what to do. On August 18, I went out with A., fialonia, JLP, RL and FL for dinner at Restaurant 18. A. and I had been here before, and I had considered it as a location but thought it would be waaaay out of our price range. But when I looked it up, it actually wasn’t that bad. Then I met with the wedding coordinator person and realized it really, REALLY, wasn’t that bad. Is it a tad expensive? Certainly. But it’s perfect. It’s pretty, near the hotels, has good food, doesn’t require us to have a DJ, and the woman running the joint is well-organized and friendly. Yay! The picture above is the outside and the picture below is the only shot I could find of the inside. All stone and covered in funky art done the by the owner. Location? Check.